This is one of the most beautiful theaters in Lisbon, right in the middle of Chiado. You can go watch a performance or chill out at the Mini bar Teatro. Inaugurated at the end of the 19th century by the Portuguese King and Queen D. Carlos and D. Amélia, the once-called Teatro D. Amélia and later Teatro República (1910) was also a cinema in 1928. Its first movie projection was Metropolis by Fritz Lang. 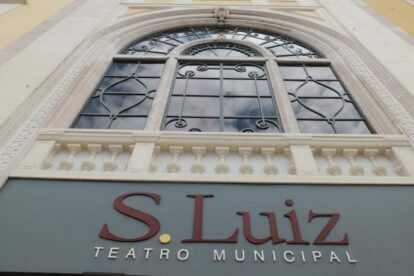 In 1971 the now-called S. Luiz Municipal Theater (named after one of it’s bigger supporters) was purchased by the City Hall and later remodeled. With different rooms and performances, it has a very rich cultural offering. Another great thing about S. Luiz is that it encourages access to culture for everyone. They have sign language and audio description services for the deaf and blind communities, and also specially tailored performances for families with little children or individuals with disabilities that require softer and more relaxed environments (such as autism or attention deficit disorders). You can also contribute and purchase a “suspended ticket” for 7€ (the rest is covered by the theater) that will be available for people who can’t afford it and are assisted by a number of social institutions and organizations.